The SPM-622 supports a wide range of military applications by enabling the operator to maintain constant operability of radios, satellite phones, laptops, tablets, and other electronic devices – regardless of power source. The SPM-622 can draw, or ‘scavenge’, power from any source batteries, solar blankets, vehicle power outlets, or the local A/C power grid. The device then automatically converts that power to run electronic equipment, as well as simultaneously charging one or more batteries. Thanks to the SPM’s intelligent power management system no special configuration or programming is needed in order to convert and manage the power that the unit is drawing, or passing through. The result is that the warfighter can carry fewer batteries and also actively monitor and manage power usage for greater operational efficiency – even in the most austere operational environments. The SPM-622 Squad Power Manager is rugged, reliable, easy-to-use and operationally proven. Thousands of them are currently in use with all US DoD branches, USSOCOM components, international SOF, and specialist roles such as JTAC, EOD, Para-Rescue and Medics. Supports most currently deployed military radio systems, including; PRC-148, PRC-154, PRC-117F/G, PRC-152, MPU-4, Motorola, etc. Recharges most military and commercial rechargeable batteries, including Conformal Wearable Battery, power tool batteries, and the latest high performance radio batteries. Six universal power connections permit versatile operation— powering devices, managing energy sources, and charging up to five batteries—any or all of which can occur simultaneously. 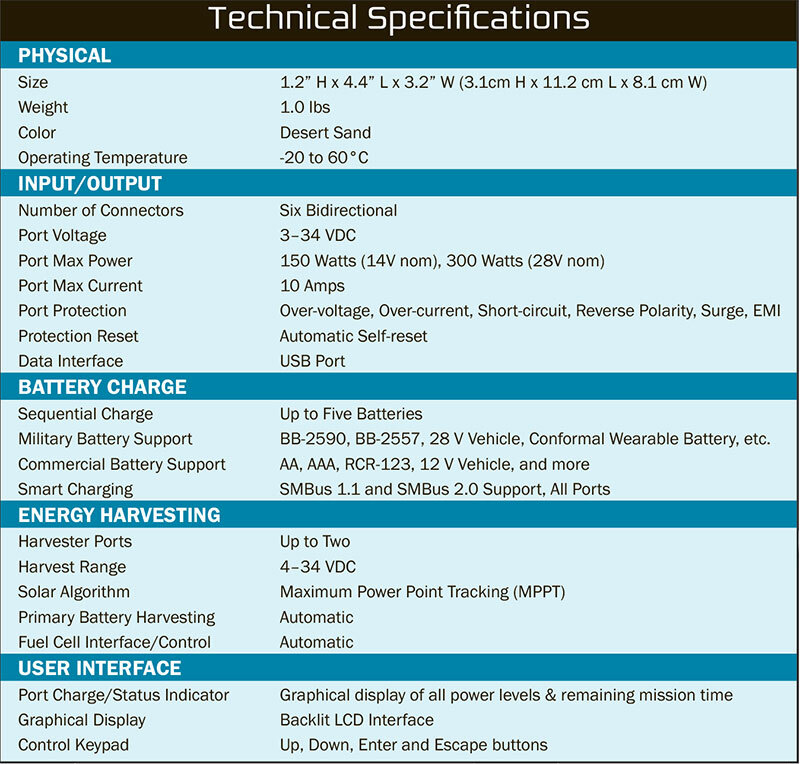 Full SMBus and USB connectivity for set-and-forget, accurate state of-charge indication, battery health monitoring and reporting, and mission profiling/configuration. Totally weatherproof and able to function fully submerged. We provide a wide range of accessories and cables for the SPM-622. Visit our SUPPORTED EQUIPMENT and APPLICATIONS pages to see examples of what the SPM can do. If you do not see what you need, please feel free to CONTACT US to discuss your requirements. The SPM-622 supports a wide range of mission-essential military applications. To find out more, visit the APPLICATIONS section of our website. The SPM-622 has also been integrated into a wide range of end-user specific solutions. To find out more, visit the SOLUTIONS section of our website. Want more information on the product before you purchase?